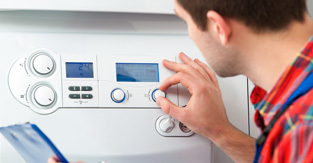 Is your Combi Boiler Losing Pressure? There’s many reasons why your combi boiler may be losing pressure, one of the most common problems is when a new boiler is added to old pipework which may have an unnoticed leak. The modern boilers work under much higher pressure than older models, and so a fault that could have been undetected in the past could cause disruptions with the new installation. If the pressure drops, the boiler will shut down and as a safety feature they will stop working. A combi boiler losing pressure can be a major inconvenience to your home or business, removing your supply of hot water and heating and so it’s essential that it’s fixed as quick as possible. If this occurs traditional methods to find the leak could be quite disruptive and could entail a lot of man hours to find – an alternative to this is leak detection. Here at Cheshire Plumbers we utilise the very latest leak detection equipment to find the leak quickly and efficiently. This means we can then find the source of the problem and get your boiler fixed as soon as possible. We have a team of highly trained staff who are experts at using the leak detection equipment and have over 10 years experience in the industry. This means that you’ll receive the highest standard of workmanship, to get your problem sorted quickly. If your combi boiler is losing pressure then please get in touch with a member of our expert team. Other signs that leak detection could be of help to your plumbing problems are unexpected water meter readings, lost header tanks running and underfloor heating leaks. Contact a member of our expert team for more information about how we at Cheshire Plumbers can help you.